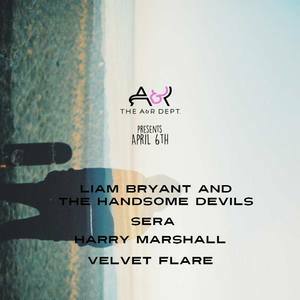 The A&R Department presents Liam Bryant & The Handsome Devils, Velvet Flare, Sera & Harry Marshall for one night only. It's $10 at the door and featuring local brisbane talent. Please spread the word.LIAM BRYANT + THE HANDSOME DEVILS~~~~~~~~~~~~~~~~~~~~~~~~~~~~~~~~Liam Bryant & The Handsome Devils is a progressive acoustic act hailing from Brisbane. Their debut album is OUT NOW!+ Velvet Flare, Sera + Harry Marshall.